At eighteen, I backpacked through the Alaskan tundra with five other teenagers alone, got lost in mountain fog, strained a ligament in my knee, and climbed wet, slippery rock faces with a 50 pound backpack for twenty-three days. At nineteen, I navigated my way through the Czech Republic with only my broken German to help me after my train broke down three times and my bus broke down numerous more. At twenty-one, I boarded a train in New Delhi with a severe stomach virus to volunteer in a remote village in rural India by myself. But at twenty-three, I would have panic attacks every time my mom left the apartment to go to the grocery store. I was afraid to take showers and walk up stairs. I was an absolute mess. Where did my adventurous, bold, and completely badass version of myself go? A year ago I was sitting in an Indian movie theater watching Logan during my Fulbright and I could feel my heart revving up. I looked down at my Fitbit my heart beat was flying along at 130 beats per minute. As an EMT, I knew that this was fast, but not the worst, so I decided to leave the theater and take a break. It didn’t get better. My heart kept beating faster and faster until it hit 190 beats per minute and stayed that way until all the ER doctors and nurses at a small hospital in Calcutta crowded around me and restarted my heart with adenosine. I was diagnosed with SVT, supraventricular tachycardia, a usually harmless, but incredibly scary, and annoying, heart arrhythmia. Usually SVT episodes start and end suddenly, but it never seemed to stop completely for me. Not unless I was laying down. Everytime I stood, I could feel my heart beating out of my chest within seconds. I found myself seeing every specialist in Delhi and after several more ER visits and no answers, I was on my way home with a cardiac flight nurse. A day later at Duke, I was diagnosed with POTS (Postural Orthostatic Tachycardia Syndrome). POTS is a form of dysautonomia, in which your body has inappropriate nervous system responses after standing, typically shown with a massive increase in heart rate. What a ridiculous chronic and incurable syndrome! They assured me that POTS isn’t dangerous and that it could get better with time, but I went home, petrified. I was no longer adventurous– I never left my couch. I was no longer bold– I was so afraid of pushing the limit and setting off another SVT I didn’t want to test the limits. And I sure wasn’t badass anymore– I had become a boring grandma. My heart rate jumped over 100 beats per minute within seconds of standing and my only prescriptions were water, salt, compression tights, and yes, exercise. I felt hopeless and in a horrible cycle of feeling a symptom, getting anxious about it, then feeling more symptoms because of it and eventually would become paralyzed with fear on the floor with my feet up, hoping my heart doesn’t stop. 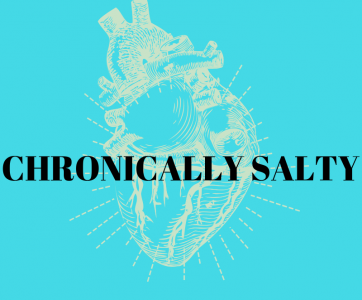 When in full flare, I have a syndrome that makes you feel like you are having a constant heart attack, which then spawns a panic attack, and those heart-panic attacks took over my life for most of the past year. I remember waiting in the airport for my boyfriend to land after his own year abroad in China. I was so excited to see him, I had to use a wheelchair because my heart was freaking out. I then got so nervous about my heart, that I ended up having a panic attack in the airport and it ruined my entire night. It was that night that I realized I let my anxiety take control of me. It wasn’t just scary situations that ended in panic, but also exciting and happy moments. I became so focused on my body, I couldn’t see anything past my POTS and life seemed pretty grim. But I knew that I needed to find a way to cope. Exposure therapy, CBT, and a great family helps me cope with my health anxiety. But one thing has help more than anything else and that is time. I knew about POTS before I was diagnosed with it. Having realized this was probably my issue while stuck in an Indian hospital, a lot of my free time was spent on WebMD hoping this wasn’t my fate and praying that I could just have a heart ablation for my SVT, walk away, and not have to deal with scary symptoms for the rest of my life. But here I am, a year later. I still have SVT, I definitely still have POTS, but the anxiety is no longer creating a cage around me and keeping me locked in with my chronic illnesses. Sure, my heart races when I stand, sometimes I get SVTs, and I panic about them at times. But deep down, time has shown me that they will pass eventually and that gives me the patience to ride the flares out. So you may be asking yourself a few questions: have I regained some of my adventurous, bold, and badass self? Well, I’m now a badass grandma of a twenty-four year old. I wear purple compression hose, I can do 50 minutes on the recumbent bike, I have finished five 1000 piece puzzles in eight months, and can drink nine liters of water in a day. Now that’s a bold act with your bladder. Very inspired reading about your journey. You are fortunate that you got diagnosed so quickly. Thanks for the reviews on the drinks. I will pas them on to my daughter who was diagnosed a few months ago. Thanks for the read! It can definitely be overwhelming at first, but definitely gets better with time!